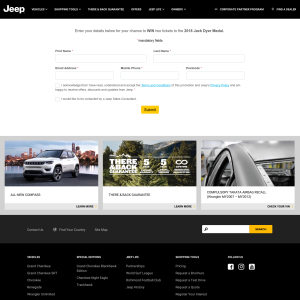 This Promotion is conducted by FCA Australia Pty Ltd, ABN 23 125 956 505, of 437 Plummer Street, Port Melbourne, Victoria 3207 www.jeep.com.au / (03)8698 0200 (Promoter). Information on how to enter, all entry instructions, the Prize, advertising material and prize information published by the Promoter form part of these Terms and Conditions. Entry and participation in this Promotion is deemed acknowledgement and acceptance of these Terms and Conditions. 3.5 Comply with these terms and conditions (Eligible Entrant). Employees (and their immediate families) of the Promoter and any retailer, supplier, associated company or agency of the Promoter or other person associated with this Promotion are ineligible to enter. Immediate family means any of the following: spouse, ex-spouse, de-facto spouse, child or step-child (whether natural or by adoption), parent, step-parent, grandparent, step-grandparent, uncle, aunt, niece, nephew, brother, sister, step-brother, step-sister or 1st cousin. The Promotion commences at 9:00am AEST on 1 August 2018 and closes at 11:59pm AEST on 3 September 2018 (Promotion Period). Entries received by the Promoter after the Promotion Period ends (irrespective of when they were sent) will not be included in the Promotion. Entries will be deemed to be accepted at the time of receipt and not at the time of transmission. Incomplete, inaudible, indecipherable or incomprehensible entries will be deemed invalid. The Promoter reserves the right, at any time, to verify the validity of entries and entrants (including an entrant’s identity, age and place of residence) and to disqualify any entrant who submits an entry that does not comply with these Terms and Conditions or who tampers with the entry process. Entries will be deemed void if stolen, forged, mutilated or tampered with in any way. Errors and omissions may be accepted at the Promoter's discretion. Eligible Entrants are permitted to submit only one (1) entry. Eligible Entrants can only enter in their own name. The use of automatic entry software, mechanical or electronic devices that allows an individual to automatically enter the Promotion is prohibited and any such entries will be invalid. If there is a dispute as to the identity of an entrant, the Promoter reserves theright, in its sole discretion, to determine the identity of the entrant. The draw will be conducted by CIE Legal. The draw will take place on 4 September 2018 at 3:00pm AEST at Level 11 Como Office Tower, 644 Chapel Street, South Yarra, Victoria 3141. The Promoter may draw additional reserve entries and record them in order in case an invalid entry or ineligible entrant is drawn, or in the event the Prize Winner is unable to attend the Jack Dyer Medal which forms part of the Prize. The winner will be notified in writing via email within two (2) business days of the draw and their name will be published in the public notices section of The Australian within 30 days of the draw. The Promoter’s decision is final and no correspondence will be entered into.The first valid entry drawn will win the Prize (Prize Winner). The prize for the Promotion is two (2) tickets to attend the Jack Dyer Medal including food and beverages (Prize). The Prize does not include airfares or transport of the Prize Winner and their companion to and from Crown Melbourne. The Prize Winner’s companion must be aged 18 years or over. The total Prize pool is valued at up to AUD $800.00. The Prize and any element of the Prize is not transferable, exchangeable or redeemable for cash. Prize values are in Australian dollars and are correct at the time of printing. The Promoter accepts no responsibility for any variation in the value of the prize. The Prize must be redeemed at the Jack Dyer Medal. In the event that the Prize Winner is unable to redeem the Prize on this date, the Prize Winner will forfeit their right to the Prize. The next valid entry drawn in accordance with clause 11 of these Terms and Conditions will be awarded the Prize. The Promoter reserves the right to prohibit the Prize Winner taking part in any or all aspects of the Prize if the Promoter determines in its absolute discretion that the Prize Winner is not in the mental or physical condition necessary to be able to safely participate in the Prize. Should the Prize for the Promotion remain unclaimed, or if for any reason the Prize Winner does not accept the Prize by 10 September 2018 at 3:00pm(AEST), despite every reasonable effort taken by the Promoter to contact the Prize Winner, then the Prize will be forfeited. The Promoter will award the Prize to the next valid entry drawn in accordance with clause 11 of these Terms and Conditions. If the next valid entry drawn cannot be contacted within 2 hours, the Promoter will contact the next drawn winner until a prize winner is contacted. It is a condition of accepting the Prize that the Prize Winner comply with all conditions of use of the Prize and the Prize suppliers’ requirements including, but not limited to, any rules, dress codes or other conditions imposed by Crown Melbourne. Subject to the terms and conditions of the participating Prize provider(s), if for any reason the Prize Winner does not, once the Prize has been booked, take the Prize (or an element of the Prize) at the time stipulated, then the Prize (or that element of the Prize) will be forfeited and will not be transferrable, exchangeable or redeemable for cash. To the extent permitted by law, the Promoter reserves the right not to award thePrize if a suitable winner cannot be identified prior to the taking of the Prize. The Promoter reserves the right in its sole discretion to disqualify any individual who it has reason to believe has breached any of these Terms and Conditions, or engaged in any unlawful or other improper misconduct that may jeopardise the fair and proper conduct of the Promotion. The Promoter’s legal rights to recover damages or other compensation from any offender(s) are reserved. Failure by the Promoter to enforce any of its rights at any stage does not constitute a waiver of those rights. In the event of unforeseen circumstances, war, terrorism, state of emergency or disaster (including but not limited to natural disaster), or the Promotion being interfered with in any way, including technical difficulties, unauthorised intervention or fraud, so that it is not capable of being conducted as reasonably anticipated, due to any reason beyond the reasonable control of the Promoter, the Promoter reserves the right, in its sole discretion, to the fullest extent permitted by law, and subject to any written directions from a regulatory authority, to: (a) cancel, terminate, modify or suspend the Promotion; (b) disqualify any entrant; or (c) suspend or modify the Prize or any element of thePrize, as appropriate. If the Prize (or an element of the Prize) is unavailable, the Promoter, in its discretion, reserves the right to substitute the Prize (or that element of the Prize) with a prize to the equal value and/or specification, subject to any written directions from a regulatory authority. The Promoter, Richmond Football Club and their associated Crown Melbourne event organisers hereby expressly reserve the right to eject the Prize Winner (and/or his/her companion/s) for any inappropriate behaviour, including but not limited to intoxication, whilst participating in any element of the Prize. Eligible Entrants consent to the Promoter using their name, likeness, image and/or voice in the event they are a Prize Winner (including photographs, films and/or recordings of the same) in any media for an unlimited period without remuneration for the purpose of promoting this Promotion (including any outcome), and promoting any products manufactured, distributed and/or supplied by the Promoter. Nothing in these Terms and Conditions limits, excludes or modifies or purports to limit, exclude or modify the statutory consumer guarantees as provided under the Australian Consumer Law (contained in Schedule 2 of the Competition and Consumer Act 2010 (Cth)), as well as any other applicable implied warranties under the ASIC Act or similar consumer protection laws in the State and Territories of Australia (Non-Excludable Guarantees). To the full extent permitted by law, the Promoter, the Promoter’s officers, employees and agents, except for any liability that cannot be excluded, including the Non-Excludable Guarantees, the Promoter’s related companies and all those entities' personnel exclude all liability for any loss (including any damage, claim, injury, cost or expense, including loss of opportunity) which is suffered or incurred by any individual in connection with the Promotion or Prize, including but not limited to: (i) any technical difficulties or equipment malfunction (whether or not under the Promoter's control); (ii) any theft, unauthorised access or third party interference; (iii) any entry or Prize claim that is late, lost, altered, damaged or misdirected (whether or not after their receipt by the Promoter due to any reason beyond the reasonable control of the Promoter; (iv) any variation in Prize value to that stated in these Terms and Conditions; (v) any tax liability incurred by the Prize Winner or entrant; (vi) the Prize(s); or participation in or use of any Prize(s) and/or attendance at the Jack Dyer Medal, and Crown Melbourne; (vii) any direct, indirect, economic or consequential loss; (viii) any loss arising from the negligence; (ix) any liability for personal injury or death including caused or contributed to participation in the Prize or anyelement of the Prize. The Promoter collects personal information in order to conduct the Promotion and may, for this purpose, disclose such information to third parties, including but not limited to agents, contractors, service providers, Prize suppliers and, as required, to Australian regulatory authorities. Entry is conditional on providing this information. All entries become the property of the Promoter. As a condition of accepting the Prize, the Prize Winner (and his/her guests) may be required to sign any legal documentation as and in the form required by the Promoter and/or Prize suppliers in their absolute discretion, including but not limited to a legal release and indemnity form. Eligible Entrants may receive electronic marketing communications from the Promoter in relation to FCA Australia’s products or services or for other promotional purposes. Where the Eligible Entrant has consented to receiving direct marketing communications from the Promoter, the Promoter may use the information to engage in direct marketing with the Eligible Entrant, and may disclose the Entrant’s personal information to its related entities and contractors for the above purposes.